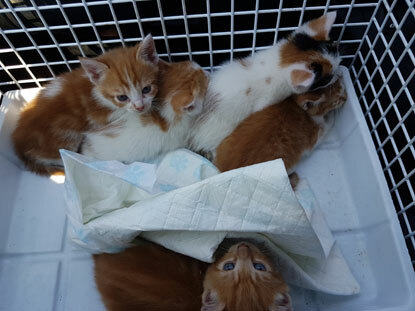 Staff at The Wave and Swansea Sound radio stations in Wales had an eventful day at work when they helped to rescue five cute kittens from a skip outside their headquarters. They had noticed a moggy hanging around the area for a few weeks, thinking she was an owned cat who was out exploring. However, they soon realised she wasn’t alone. 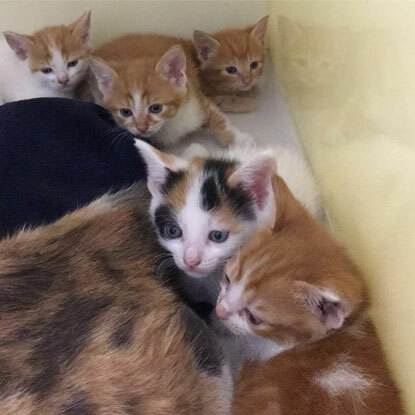 Early in the morning on 2 July, breakfast show presenter Claire Scott noticed the cat, who she had named Brambles, emerging from an overflowing skip at the back of the office with a couple of tiny kittens in tow. The Wave team called Cats Protection’s Swansea & Distract Branch for help, and they arrived on 5 July to collect the family and take them to the vet. Brambles was soon tempted into a cat carrier with some food, but the kittens proved a little trickier to find. Luckily, The Wave team were on hand to help out. 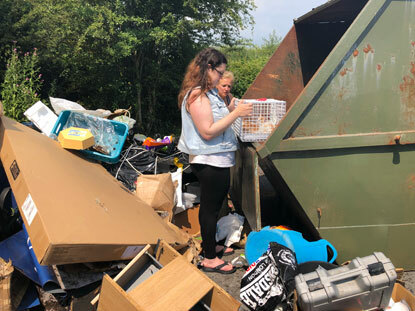 "They needed some mug to get into the skip and empty it,” said Rhydderch Wilson from The Wave’s Creative Hub. "I spent a very sweaty, dirty hour in the skip, carefully emptying the rubbish out, knowing there were several delicate life forms in there. "So I lift up a huge great cardboard box and underneath found three kittens huddled together with a fourth attempting a daring escape. I grabbed the fleeing kitten and popped it into a little basket along with her three chums. All of the kittens, one of which is now named Skippy, were then taken to the vet and reunited with their mum. The family are now in the care of the Swansea & District Branch and will neutered before being found loving new homes. That’s not the whole story though. Before Cats Protection arrived, radio presenter Badger had a shock when he found a surprising passenger in his car. "It was a hot day and I left the doors open on the car to try and cool it down a bit before I went home,” said Badger. “I jumped in the car, drove about a mile down the road and when I stopped at the traffic lights, I looked in my rear view mirror to see Brambles looking back at me. "I turned around and returned to the station, pulled into the car park, opened the rear door to let Brambles out. Anyone looking out of the window would have thought I had chauffeur-driven a cat into The Wave car park!" Well done all of you! The kittens are beautiful and it's a lovely end to what could have been a very sad story.